« Just Wondering: What can be done about dangerous drivers threatening pedestrians on Main Avenue besides yelling at them? Place crab meat in a large bowl. Gently pick through the meat and remove any shells. Add the cracker crumbs ( I place the crackers in a zip lock bag and pound them with a wooden mallet or rolling pin to make the crumbs), Old Bay and chives. Gently mix these ingredients together, use your hands, and break apart some of the larger pieces of crab. In a separate bowl whisk the mayonnaise, egg, and mustard together. Stir this into the crab mixture using your hands. Be careful not to break the pieces of crabmeat. Cover the bowl and refrigerate for at least 1 hour. This will help form the crab cakes and prevent them from falling apart. 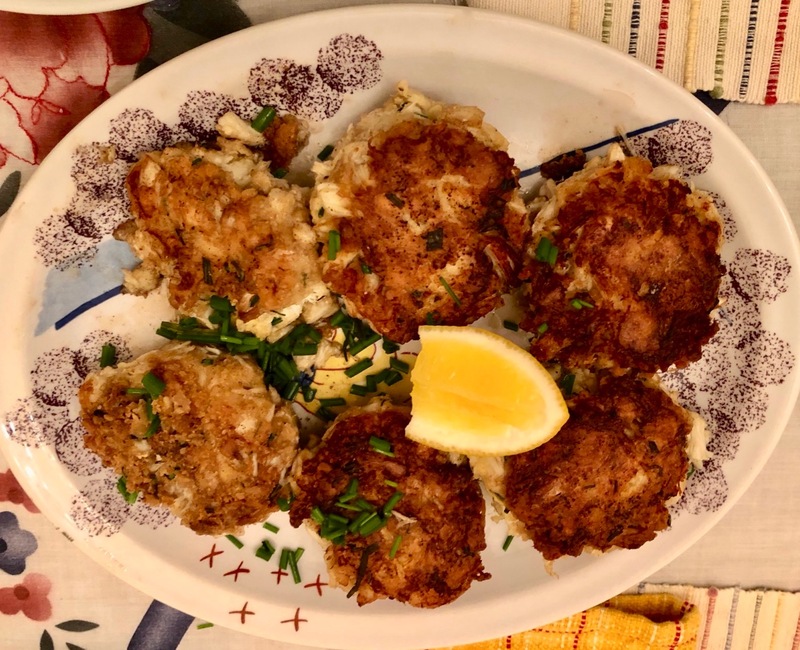 Scoop approximately ½ cup amount of crab mixture in your hands and carefully form cakes about 1” thick. This should make 6 crab cakes. Place them on a tray until all cakes are formed. Heat a 12” non-stick fry pan or cast iron pan (my preference) over medium heat. Add the oil and when it begins to simmer add the cakes to the pan. Cook cakes for 4 minutes or until they turn golden. Lower the heat to medium low, add the butter to the pan and turn the cakes over. Cook them for 4 minutes or until they turn golden. Wegmans is having a “Crab Fest” featuring Maryland Blue Crabs live or steamed on August 4 from 12 pm to 5 pm. Note that they are for eating as is. Eileen’s recipe calls for crabmeat packaged all ready for turning into crab cakes. Maryland crabs are the best. So don’t be crabby. Make a batch for your family.